I’m sitting here, curled up on the sofa with a fuzzy blanket, eating a warm and comforting bowl of chili. We didn’t lose power as expected, but still, this storm has propelled me into fall behaviour. Clearly, while I was busy picking paint colors for the hallway and perusing catalogues for dining room chairs, and imagining ways to rework the landscaping in our new backyard, summer happened. And now it’s almost over. Next weekend marks the unofficial official end of the season, and I’m not ready. I’m still hooked on zucchini, and craving corn. I guess I need to cram as much summer flavor as I can into the coming days. In case you’re feeling the same way, below are some of my favorite summer recipes, worthy of one last hurrah, and also lovely additions to a Labor Day BBQ spread. 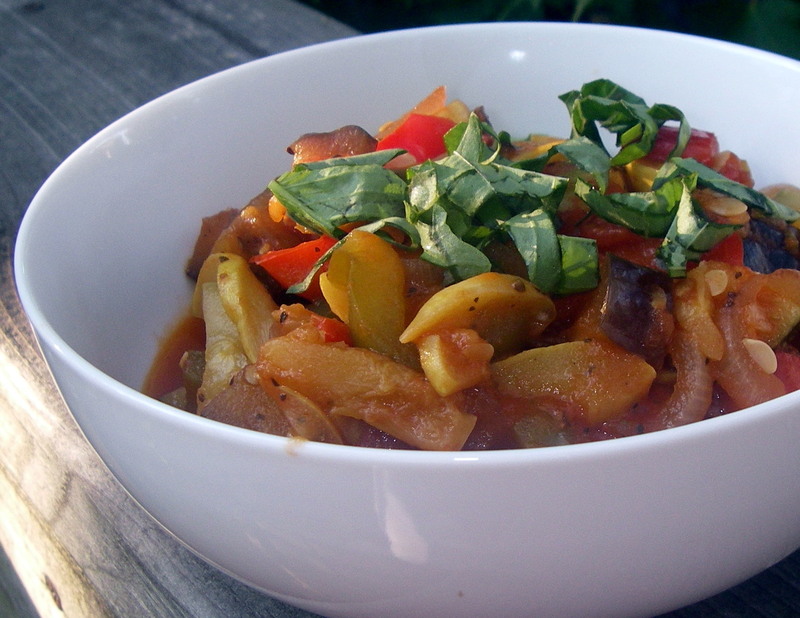 Perfect for using up those summer veggies, this simple ratatouille is delicious over grilled chicken or fish, and wonderful at room temperature tossed with cooked pasta for a veggie-filled pasta salad. Pretty and pink! 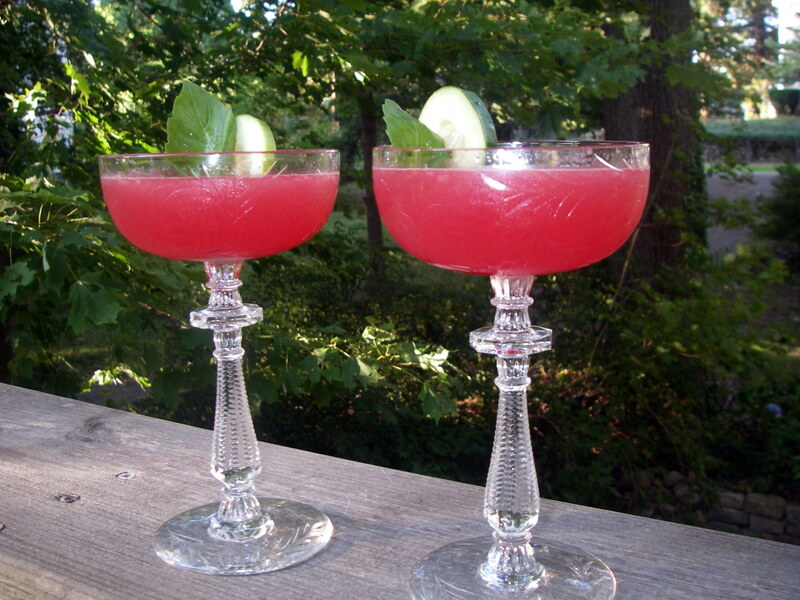 This refreshing summer drink is fantastic for a labor day BBQ. You can make a big pitcher and let your guests help themselves. To me, malts and milkshakes scream summer. 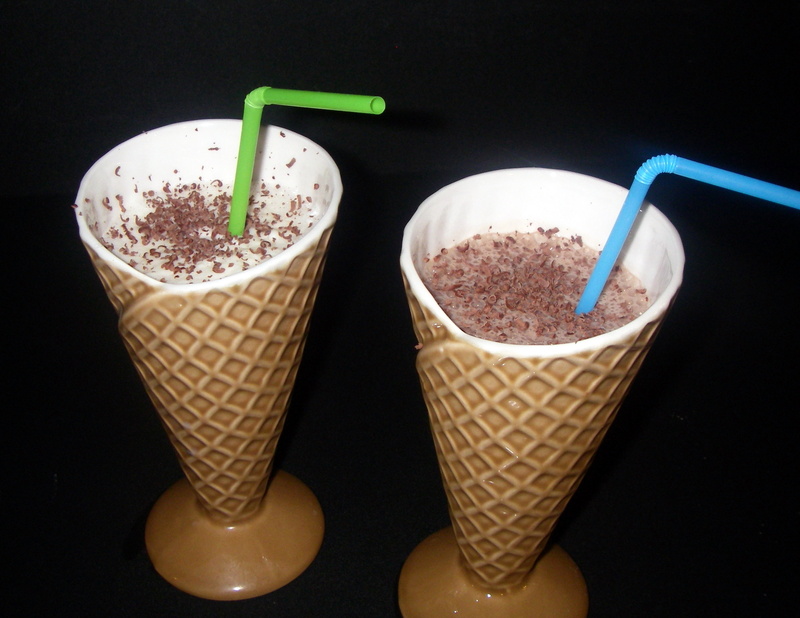 Enjoy a malt from a huge glass with a bendy straw for an old-school treat. Or try serving them in little shot glasses for a really fun BBQ dessert! I spend August in pursuit of perfect tomatoes. And once those tomatoes arrive, using them in every possible dish becomes my mission! 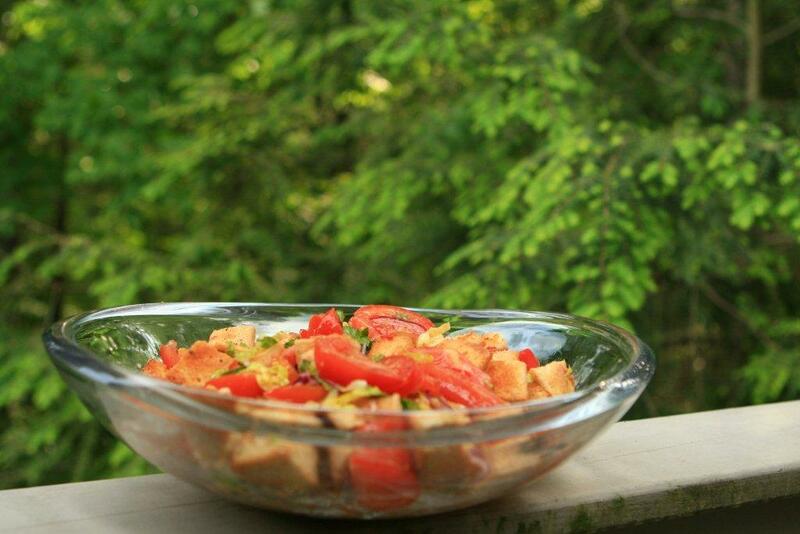 This simple panzanella salad is lovely and easy and full of fresh flavor. I’d love to tell you all that I sit out on my deck each morning, savoring a steamy cup of coffee with frothed milk, leisurely reading the newspaper, thoroughly enjoying a three-course homemade breakfast on good china. But the truth is, I usually run out of the house with my hair still wet and scarf down breakfast at my desk. Which is why I have a bit of an obsession with hotel breakfasts; they are a calm, pleasurable, and relaxing way to start the day. And I especially love European hotel breakfasts. A basket of flakey pastries, a big pot of coffee, and a buffet of flavorful cheeses, fresh fruits, and, best of all, bircher muesli. The Intercontinental in Bucharest, Romania makes a lovely, creamy bircher muesli. So does a tiny Bed and Breakfast outside Bansko, Bulgaria. 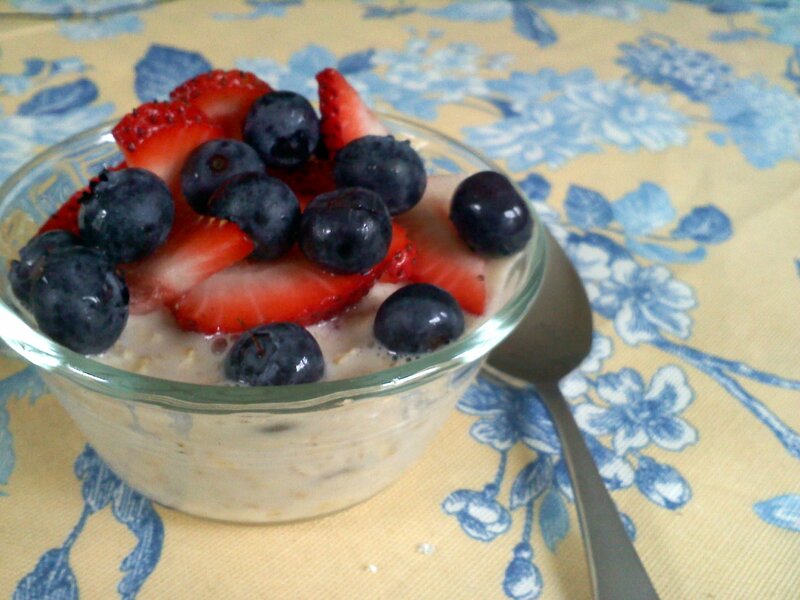 A little Inn near Toulouse, France serves a version so wonderfully rich that no amount of tiny, fresh, sweet strawberries can turn these cream-laden oats into a healthy breakfast. I’ve been experimenting for years, trying to recreate my favorite European breakfast experiences. The very best traditional bircher muesli is usually made with oats, nuts, dried fruit, full-fat yogurt and heavy cream. Perhaps it’s a difference in the yogurt, or my discomfort using more than a splash of cream in what should be a healthy breakfast, but I have never quite mastered bircher muesli. I’ve tried combinations of yogurt, milk, apple juice, soy milk, and cream, some better than others. In fact, soy milk was a surprising front runner. And then last weekend, I was wandering around Whole Foods with my friend Laran, who happens to be allergic to soy. We were chatting about the merits of a portable breakfast when it occurred to me that, instead of soy milk, almond milk might just be the thing to elevate my muesli. And I was right. All the creaminess, and no off flavor. It may not be quite the traditional European bircher musali, but it is certainly a delicious, healthy, portable breakfast. I love that I can make this the night before, and then grab it out of the fridge as I start my mad dash to work in the morning. It would, of course, be just as tasty were I to spoon it into a pretty glass and savor each bite while admiring my sunny flower beds. Stir all ingredients except the berries together in a bowl until well combined. Cover and refrigerate overnight. To serve, stir well and then spoon the muesli into bowls and top with plenty of berries. This recipe doubles easily, and keeps well in the fridge for up to three days, but be sure to wait until the last minute to add the berries. I love fresh herbs, but I realized the other night that my thinking about herb usage has been a bit narrow. Sure, I pair fresh basil with ripe tomatoes, rub roasted chicken with thyme, and top fish tacos with cilantro. I toss fresh chopped mint with berries, infuse it into chocolate mousse, and use it to garnish lemon tarts. But until now, I have rarely used mint in savory dishes. I know, I know… you’ve been making lovely minted pea salads for years, and enjoying mint pesto on your lamb kebabs as long as you can remember. But it would seem that I’ve had a mint mental block. I’ve long reserved mint for dessert. But no longer. 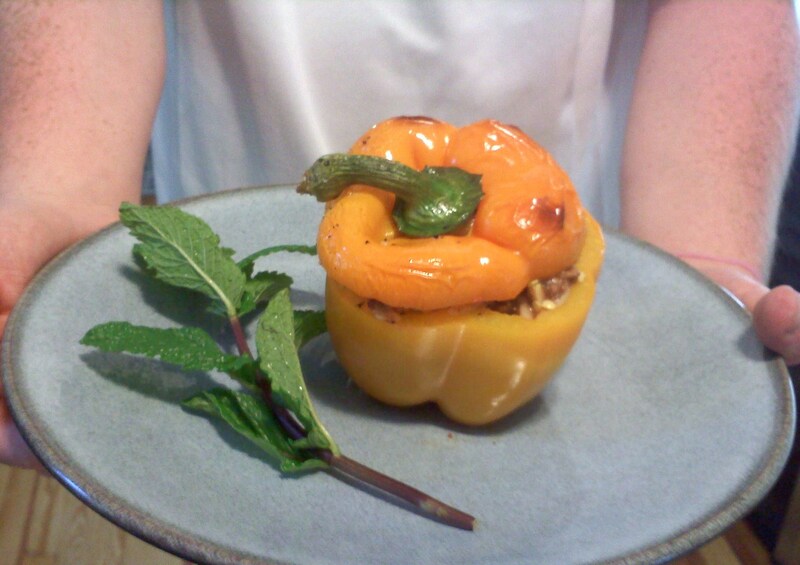 The background of fresh mint in these stuffed peppers is surprising, but fits so naturally with the rich, meaty filling. Neither frosty nor sweet, the mint here simply adds an herbacious intensity that brings these peppers to life. I’ve made stuffed peppers before, this lentil stuffed version, in particular, is a favorite. When I posted those lentil and rice stuffed peppers, I was yearning for a healthy, filling meal that would reheat well from my lunch box. These beef, orzo, and herb stuffed peppers are just as nutritious, filling, and portable. And while the bell peppers in my garden are still quite tiny, this would be a wonderful way to use up garden surplus. It is most certainly a great way to put some of that mint overtaking your garden to work on your table. These peppers have a whisper of Greek influence, but you could substitute a bit of lamb in for the beef, and add a drizzle of good olive oil to pump up the mediterranean flavor. 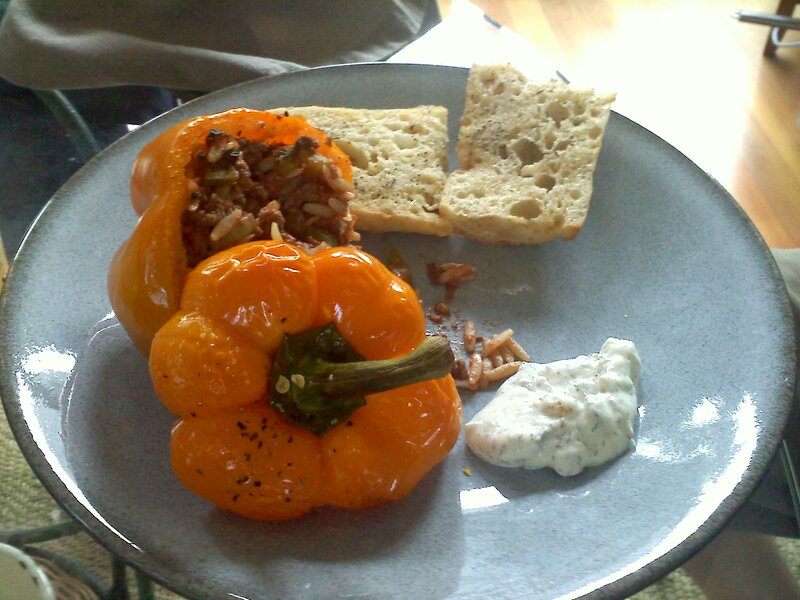 I served my peppers with a dollop of sour cream, but a bit of tzaziki would add both creaminess and additional flavor. Slice the tops off of the peppers, core and rise the insides of the peppers, and arrange them in a baking dish. Bring a few cups of salted water to a boil and cook the orzo until al dente. Meanwhile, heat the olive oil in a saute pan over medium heat and cook the garlic, onion, and celery until slightly soft, about 3 minutes. Add the beef and cook, breaking up with a spoon until browned. Preheat the oven to 400 degrees. In a large bowl, stir together the orzo, beef mixture, tomato sauce and plenty of salt and pepper to taste. Stir in the oregano and mint. Lightly spray the insides of the peppers with cooking spray and sprinkle with salt and pepper. 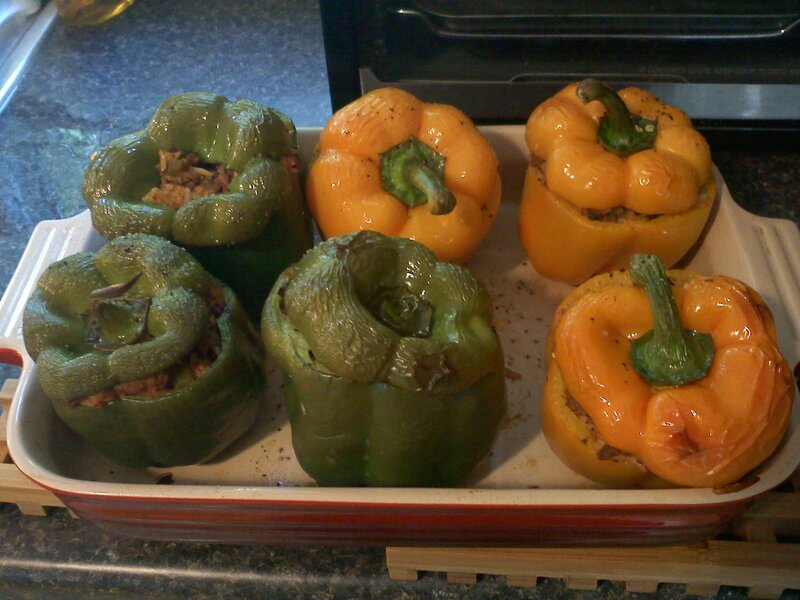 Fill the peppers with the beef mixture and top each pepper with its cap. Add a few tablespoons of water to the bottom of the baking dish. Bake until the peppers are a bit shriveled and tender but still slightly crisp, about 45 minutes.